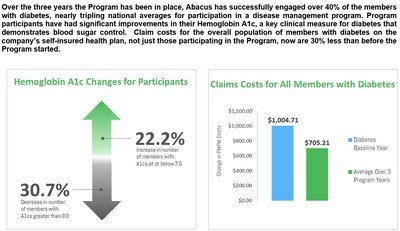 NORTHLAKE, Ill., July 10, 2018 /PRNewswire/ -- Scholle IPN employees and family members living with diabetes receive a tremendous benefit through the Abacus Health Solutions (Abacus) Diabetes Care Rewards Program. The program provides a private and confidential support service that helps members with diabetes more effectively manage their condition. The results are better health and lower costs for participants and the company. Diabetes is a very serious disease, and when not properly managed, it can lead to severe and life-threatening complications such as blindness, amputation, kidney damage and heart disease. Diabetes, and other chronic conditions, are a significant cost driver of employers' healthcare costs. The American Diabetes Association reports that people with diagnosed diabetes account for 1 in 4 healthcare dollars in the U.S.
"There are well established guidelines for diabetes care, but we know ongoing engagement in preventative care is a big issue today," said Ed Aberger, Ph.D., EVP of Abacus. "Members who are active in managing their condition with care provided by their own primary care doctors are much less likely to have adverse events and be hospitalized. By engaging members with their own doctors, we are also able to address both complications and comorbidities (other illnesses a patient has in addition to diabetes) as part of a comprehensive patient-centered evaluation." Bryan Karetny, the Benefits Consultant for Scholle IPN with Marsh & McLennan Agency who recommended the Abacus Program, notes, "The cost of necessary diabetes maintenance medications, like insulin, creates a barrier to adherence. The Program promotes adherence to diabetes medications and supplies by removing the copayments for those members who are active in the Program. Members provide very positive feedback about the additional education, guidance, communications and incentives offered through the Program."